The recently passed IL Energy Bill is a good thing for the environment and yet, a perfect example of the costs involved with clean energy. Whether the costs be in dollars, nuclear dangers, or income inequality, clean energy is not free energy. The Illinois House and Senate recently passed SB2814 to re-vamp the Public Utilities Act. Now, it must go on to the Governor’s office and Rauner is expected to approve it. The main provision is that it keeps the Clinton and Quad City Nuclear Power Plants in operation. This ensures a combined 2,032 MW of clean power will remain online at a price of $235 million. The contention is that the subsidy will make electricity more expensive and flies in the face of capitalism. I’ll explain why this bill is a good thing for clean energy and why the costs are worth it. 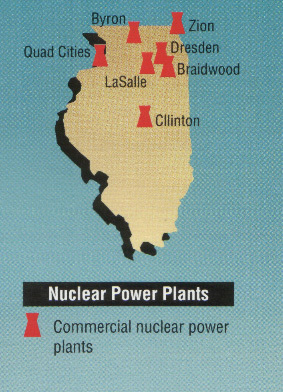 The decommissioning of Exelon’s Clinton and Quad City power plants would have brought 2,032 MW of baseload power off the grid. This is a consistent source of clean power which stays on more reliably during the winter when other plants have problems. According to Illinois’ energy profile, this energy would be replaced by 36% coal and 13% natural gas. At a CO2 output rate of 2,070 lbs. CO2/MW burning bituminous coal and 1,220 lbs. CO2/ MW burning nat gas, taking these plants offline would have added 7.7 million tons of CO2 every year. One alternative I asked myself is what if those dollars were spent on wind farms? Applying the $235 million to wind energy at a cost of $1.3 – $2.2 million per MW of capacity would have bought you 107 – 181 MW of wind. This is not nearly enough to make-up for the 2,032 MW coming offline from the nuclear plants. This doesn’t even take into account the fact that other sources would still be needed to compensate for the intermittency of wind. So, not only would this scenario not nearly make-up for the power the nuclear plants supply, but you would also need the same amount of capacity anyway for when the wind doesn’t blow. The $235 million spent on wind would be grossly inadequate in compensating for the power needs of the nuclear plants coming offline. Let us not be mistaken, this clean nuclear energy comes at a cost. In dollar rate terms, estimates range from $.25 to $4.54 on monthly bills. Although this may be less than building brand new nuclear plants (politically intractable anyway), it is not negligible. This cost is worth it as I see it as being closer to the lower amount. Another cost is with nuclear safety. This includes costs of both a potential catastrophe and what to do with nuclear waste. This is where it really gets into a dilemma for environmentalists with the ultimatum choice between nuclear or carbon. An ethical dilemma has never been so apparent. Once again, the right choice was made. While the nuclear threat is real, it is largely sensationalized. Engineering and policy has improved to protect against accidents, and it is relatively small to the slow, steady, and un-publicized effects that pollution is having. The third cost is the contribution to economic inequality. In simplest terms, this is because any rise in electricity rates will disproportionately affect the low-income by virtue of energy bills being a larger percentage of total expenses for the low-income than it is for the high-income. Economic inequality is a massive problem with it being the highest now in the United States than it ever has been. I would have liked to see a more socially just allocation of the costs; even though problems of fairness arise when you segregate utility rates based on economic levels. This was almost done in earlier versions of the bill with a demand charge for peak energy used, but the final version did not include this in order to get the bill passed. While some say that a demand charge is more of a burden for the low-income, I only see it as a benefit because the high-income and businesses will naturally use more peak power and be charged more. I invite more information on this, but overall, more can be done for a more just distribution of the utility costs. The ultimate answer to all this is a carbon tax which brings in the external costs of carbon. Since this is politically impossible, effort must be put in to policies which do have value. Only policies which are law have worth. All in all, this is a very clear example of the costs associated with real clean energy decisions. We must be willing to pay on a dollar basis, potential nuclear threats, or even economic inequality. Those who disagree are living in the clouds which are soon to experience further global warming without the practical solutions that this bill brings. 5 Non-Environmental Reasons for Clean Energy. I realize that “non-environmental reasons for clean energy” is a bit of an oxymoron since clean energy automatically means environmentally friendly by definition. However, it’s worth exploring all the reasons for the technologies that comprise clean energy, particularly solar and wind generation. Clean Energy needs backing from multiple supporters. Environmental reasons for clean energy have provided the initial and most apparent impetus to drive adoption of clean energy sources such as wind and solar. Clean energy’s economic case has been analyzed and made to work for numerous projects. The long-term economic case for clean energy can even be made through social cost of carbon studies as is being done at EPIC at the University of Chicago. However, a vast majority of clean energy development and growth has not been driven by economic or environmental reasons. If we explore some of these driving factors, we can better understand the catalysts that can spur more clean energy and get more people to support its adoption. This cultural buy-in is ultimately what’s needed as the first step to driving the implementation of policies and projects. It can create a multi-pronged approach to push renewable, distributed, and clean energy forward. The liberal greenies already have good reason to support clean energy. The benefits need to be framed up in a new way for other groups to support it. It needs to be sold in a way that doesn’t contain the green associations. The Clean Energy Group recognizes in their Solar Marketing Strategies Report that environmental reasons may not be the most compelling reason. Jobs – One of the biggest reasons given in political contexts for clean energy is the jobs it can provide. Most of the new job growth in the energy industry has come from solar and wind projects (Bloomberg). The argument is made in the state political setting that if pro-clean energy policy aren’t put in place, states can miss out on jobs. These jobs can come in the form of system installers, project developers, or hardware manufacturers. States that support the industry will be the ones to reap the benefits. As E&E News says, “Get on board now with solar and wind or miss out on jobs”. Energy Independence – America is very proud of its independence. Clean energy can serve as a manifestation of this ideal. Solar and wind energy sources are largely distributed sources. This means that they have a natural independence from the grid. Residential solar in particular takes the form of home-cited solar panels that can decouple a homeowners reliance on the grid and the powers that be who control this system. This is particularly attractive to large groups of people who want to take control of how their system operates. Integrating a battery into the system can give even more control of when and how you pull energy from the grid. Clean Energy Conservatives in North Carolina recognize this as an appealing trait for people. Decrease Dependence on Foreign Oil – Going along with personal energy independence from the system is global energy independence. This comes in the form of developing independence from foreign oil. While America’s foreign oil dependence has waned with the development of domestic shale and the oil price drops which reflect this, the US still imports 8 million barrels of oil a day. Reducing foreign oil dependence reduces foreign diplomacy complications, keeps money out of the hands of detrimental interests, and helps develop the domestic economy. In HelioPower’s blog, Nicolette puts it succinctly saying, “Reducing the oil we buy from around the world keeps our money here and out of the hands of some seriously anti-American countries”. Price Stability – Inherent in solar and wind’s cost structure is that it has no marginal costs. While natural gas, coal, and oil have variable fuel costs that continue to rise, clean energy does not have this risk of rising fuel costs. It certainly has other risks, such as when the sun will shine and how much the wind will blow, but the only cost is its upfront capital cost. The Clean Energy Group cites rising fuel cost risk in fossil fuels as a major argument when marketing clean energy. It is attractive for people to not have to worry about how much they will be paying for electricity. Religious/ Moral – Even if the environment is not of the highest importance to a person, but devotion to religion and God is, there is good reason to support clean energy. Pope Francis recently released the encyclical Laudato si supporting the protection of the planet. The 42,000 word document addresses how we are supporting our “common home”. This is an excellent way to garner the support of people who’s top priority is religion, thus diversifying the interest groups advocating for clean energy. All in all, there are more diverse ways to market clean energy other than environmental reasons. This gaining of support from diverse interests can better drive policy, funding, technology, and adoption of these sources. While the decision to install clean energy is ultimately an economic decision for many people, support from multiple sources can affect the economics of that decision. A Solarcity survey cites “saving money” as the biggest reason at 82% of the respondents for homeowners to buy clean energy products and services. These final economic decision is affected by the cultural support for technology development and policies. Thus, this cultural buy-in is the first step to creating a new, clean energy world. Author Andrew BrayPosted on September 25, 2016 Leave a comment on 5 Non-Environmental Reasons for Clean Energy. The field of Geographical Information Systems (GIS) is applicable in many different industries and in everyday life (i.e. Google Maps). It’s a large field with many complications. These include projecting a 3D surface onto a 2D map, managing the data, and combining Spatial Data Layers. The different types of data include raster (continuous scalar fields), vector (points or vertices), or image (graphic with geo-reference attributes) data models. One resource for a brief presentation on these can be found here. Geographic data is a particularly important concept in energy systems. Regulations differ by state, the sun shines in some areas more than others, transmission lines connect geographically separated areas, and people’s incomes vary across districts. All of these factors have a geographic component. These components affect where power plants, T&D lines, and other resources of the electric grid are built. In this post, I’ll be focusing on the siting of energy storage. The goal is to investigate te connection between energy storage sites and solar sites. I’ll use many simplifications and keep things fairly basic. The first step is getting and manipulating the data. Then, I’ll visualize it by mapping it. Next, I’ll try to develop a correlation between solar and storage sites. Finally, I’ll write output to a shapefile, the common filetype in GIS. The first step is to investigate the data. The solar sites data come from the NREL’s Open PV Project. This database contains voluntarily submitted information primarily from state run incentive programs, utilities, and large organizations. The only pertinent information from the data is the zipcode which is as granular as the locations get, as there is no latitude/longitude data. The next step is that I get a unique count for each zipcode to create a distribution of the number of sites in each zipcode. In order to map the sites, I need to merge the zipcodes with a database of latitude/longitudes. In this way, I have a table which contains zipcodes of solar sites, the number of projects in that zipcode, and the latitude/longitude of those zipcodes. The storage projects data come from the DOE’s Global Energy Storage Database. While the dataset contains a myriad of information on each project, the most important for this project was the zipcode and coordinates of the sites. I use the latitude/longitude of each site for more accurate mapping, but use the zipcodes data for analysis with solar data to match granularity. One problem that I came across was a lack of zipcode data. To solve this, I used the Geopy module to look up zipcodes from the more abundant coordinates data. Since, this is done with API calls to Nominatim, there is the issue of having too many calls and being errored out. For this reason, I run the code once to get the zipcodes, then save it in a file and work out of that file for the rest of the development. The first step I do is to plot the points on a map. I use the Basemap module in python to accomplish this. The projection used is the Miller Cylindrical Projection because it makes for a nice square map. Once again, the solar sites are at zipcode scale, but the storage sites are individual coordinates. There is the possibility of loss of information, especially with bigger zipcode areas which may make it look like there are fewer solar sites because the sites get aggregated together. Even so, there are still so many more solar sites, that this is a moot point. For this reason, I map the storage sites second, on top of the solar sites. There is a clear correlation between the two. This is seen in the abundance of storage sites on the east coast, west coast, and Denver where there are also more solar sites. There seem to be certain anomalies where there are more solar site than I’d expect; especially, in Wisconsin, Indiana, and Tennessee. I question the data and how it was reported. It may be the case that these are areas that are more heavily reported. It is also the case that the perceived areas get blown u because one dot is scaled pretty large for a map the size of the United States. You have to be careful of the conclusions you draw from this map. In comparing storage and solar, I look at a scatterplot of the distribution of site counts per zipcode. This is how many solar and storage sites are in each zipcode. For this I need to merge the two pieces on zipcode. I do an inner merge which means that I’m only looking at zipcodes where there is at least one solar site and one storage site. This is why there are no points directly at zero. While this plot isn’t what I was expecting (I thought I’d have a nice positively correlated plot from which I could draw a best fit line), it is telling. First of all, the scales of each are very disproportionate. There are up to 600 solar sites in some zipcodes, while the max number of storage sites in a county is 11. This makes it very hard to draw a relationship. Not withstanding, the overall trend is that there is a large number of solar sites in a zip or large number of storage sites, but not both. Finally, I want to save these points as a shapefile. This is to get experience working with python’s shapely and fiona packages. As I learned following this tutorial, Shapely manipulates and analyzes geometric data and Fiona does reading and writing of file formats. I end up saving solar points as a layer and storage points as a layer. This outputs two separate .shp files along with their corresponding .dbf (database of attributes) and .shx (index positions) files. All in all, this was a great experience in mapping clean energy in the United States. The most interesting facet of this project is to see the distribution of sites across the U.S. It’s no surprise that the coasts have a majority of the sites due to some more progressive policies. Also expected is that there are very few storage projects, especially in comparison to solar sites. There are some anomalies of there being more solar sites in the Midwest than expected. It would be very tough to predict the location of a storage site based on current solar sites, even at the relatively large granularity level of zipcodes. Other possible factors that might help prediction might be state policy environment, household income, and current energy mix of the area. Overall, a good experience in mapping clean energy. Energy storage will be a key component in the energy grid of the future. If renewable energy is going to be incorporated into the grid at significant levels, its drawbacks need to be dealt with. The biggest drawback of wind and solar is its intermittency. It fluctuates as the wind dies or clouds block the sun. Currently, this means utilities must build the same amount of natural gas generation capacity as they would have without renewable generation in order to keep the lights on in these moments. No infrastructure cost is saved, and not much fuel costs are save either, as these natural gas plants need to be kept running to be ready to go online at a moment’s notice. Storage can alleviate this problem by storing energy when renewables are generating and provide energy when renewable don’t. The value that storage brings is easy enough to see, but difficult to define. In addition, it can’t be ignored that storage doesn’t actually generate any electricity. It simply keeps it for later, and in fact uses some energy if you take into account its inefficiencies. Its value is defined differently than the dollars per kWh that energy generation is measured in. The RMI outlines many of these services in their paper on The Economics of Energy Storage. The benefits range from back-up power to transmission congestion relief. They can be of varying impact depending on where they are placed on the grid from centralized to behind home meters. The graphic provided by this report outlines the benefits very nicely. It can be difficult to make a business case for storage using only one of these economic benefits. There are much cheaper alternatives for nearly all of these. Most projects are done for their experimental benefit as a pilot project or for highly unique cases. However, the business case starts to make more sense when you start to combine these benefits. Layering the benefits while maintaining the costs creates an improved cost-benefit ratio. Being smart and strategic about how you do this makes storage more attractive. When looking into the rationale for energy storage, you have to evaluate specific use cases. Each application has different cash flows to determine whether it is beneficial or not. This includes how it is used, what amount, where, and in what policy climate. In past my previous blog post, I looked at using a battery to reduce the cost of peak electricity prices. In the scenario I evaluated, it’s tough to make an economic case for batteries. I want to extent this analysis to the use case of storage for back-up power. I’ll evaluate using a battery vs. using a generator for back-up power. Then, I’ll combine the two and evaluate using a battery for back-up and reducing the cost of peak electricity pricing. I start with using how long a blackout is estimated to last to set the parameters for the system. According to the Blackout Tracker Report by Eaton, the average blackout in 2013 lasts over 3 hours. However, it is important to remember that this ranges up to a few days. Given that the average household power demand is 1.25 kW (10,932 kWh/year ÷ 8,760 hr/year) according to the EIA, a back-up system needs to be able to store 3.75 kWh worth of energy. Or in the case of generators, simply output the 1.25 kW of power needed. Obviously, this is a gross simplification of the changing power demands of a house and how long a power duration could last, but I’ll continue with these assumptions. The two products I compare are the Tesla Powerwall and the Generac Powerpact. The Powerwall is a 6.4 kWh battery capable of delivering 3.3 kW of power. This is sufficient for the energy and power needed for this scenario. Costs include $3,000 for the battery and an estimated $1,000 for installation. The variable costs come out to $.43 per year calculated from 3.74 kWh of energy at $.10 per kWh with 92% roundtip efficiency and 95% inverter efficiency. This vriable cost is quite small, but I still wanted to include it to emphasize that the electricity that a battery uses is not free. The Powerpact costs $2,199 plus $1,000 for installation. The estimation for installation is based off this article by fixr.com on back-up energy, and I used the same installation cost for both. The generator has a power rating of 7 kW with no applicable energy capacity. This is because you can keep it running as long as you want, as long as you keep supplying it fuel. Costs of fuel are estimated to be $2.23 per hour coming out to $6.69 per year for this scenario. I compared these two by taking the present value of all the costs using a discount rate of 6.67%. The total present value of the costs come out to $4,003.26 for the Powerwall and $3,249.90 for the generator. The generator wins out by $753 as the cheaper option in this specific scenario. There are two important consideration in the summary of this scenario. the first is that this $753 may for some be considered a small amount to pay for a clean source of back-up energy. This value is different for different for different people. The second consideration is the advantage the generator has in being able to supply a limitless amount of electricity. The battery is of no use after a few hours when its energy reserves are used. The second scenario combines using a battery for back-up with using a battery to reduce peak power costs. In order to take advantage of both these benefits, we have to operate the battery in a certain way that results in a trade-off with the between peak price cost reduction and how much energy we can have for back-up. This constraint is implemented as only drawing the battery down to 50% charge when being cycled for peak power pricing reduction. This leaves at least 50% of the battery capacity available for back-up. Other assumptions and parameters are the same as before. I run this analysis in python. It uses scipy’s optimize function in the same set-up as my previous post, but with the added constraint that the battery only cycles down to 50% of its capacity. Running this optimization problem gives the cost of all the electricity charges for that specified demand. That is $4.08 per week with a battery to reduce peak power charges. This is compared to the $4.94 a week of electricity costs with no battery calculated by taking the straight demand multiplied by price of electricity at that hour. This analysis I conducted in python and can be found on my github account. Adding in the cost to fuel the generator for outages, this amounts to a difference of $51 dollars per year. This gives a value boost for battery storage which adds up over multiple years when the present value calculation is analyzed. It comes out to a present value cost of $5,516.39 for the battery set-up vs. $5,079.04 for a generator. A mere difference of $437 dollars. You can start to see you even though there is a trade-off, the combination of benefits creates more value. The third scenario is to combine a solar panel with this system. This brings about two major benefits of a longer lasting energy source and additional tax credits. These benefits were made clear to me after reading this Tesla Powerwall forum post. The major downside of using a battery for back-up is the limit to the energy it can supply. This is overcome with a solar panel which can continue to supply electricity after an outage. This is in addition to the free electricity it can supply in normal operation. The other main benefit it brings is a tax break. having a solar panel qualifies it under the Federal Tax Subsidy for Solar. This changes the economic of the entire system. The downside, of course is the additional cost of the solar panel. The size of the solar panel is calculated to be 2.7 kW. This is the amount needed to fully charge the battery in the case of an outage (7 kWh/4.8 hrs of sun = 1.45kW) plus the amount needed to fulfill the demand (1.25 kW). The 4.8 hrs of sun is the average number of hours the sun shines per day according to this table. This is in the case of an outage. In normal operation, we are always saving 50% of the battery, so it only need to be charged 50% or 3.5 kWh over 4.8 hrs plus fulfilling demand of 1.25 kW totaling 1.975 kW of solar output needed. I take the larger 2.7 kW to be the solar panel size needed. The difference ends up being $1.73 per week in regular use electricity savings. The all-in present value difference is $7,858.48 in favor of the generator. The effect is that the solar panel will charge the power and fulfill energy demands when the sun is out. The effect on the electricity bill is to provide free electricity during this time that the sun is out and provide free electricity for the amount the battery discharges when the sun is not out. As battery back-up continues to become a more affordable option, there are many other factors which come into play. Battery capacity will improve. Technology will better be able to provide ways to reduce your demand during outages to make your battery last longer. There may be ways for the residential distributed systems to access the ancillary markets and make use of this additional compensation benefit. It is worth noting the commercial size battery storage may have a different cost benefit analysis because of economies of scale, different electricity pricing, and different demand patterns. It is also important to consider that tariff structures in different states vary making battery storage more or less affordable. Python code is on my Github.